Fortnite has become a monster money-making machine for developer Epic Games. The blockbuster game generated $837 million via in-app purchases between March and May this year. The upcoming Fortnite for Android launch should further boost Epic Games’ revenues. But the developer is taking a different approach with Android. Folks at XDA Developers have obtained access to the game’s APK download files that reveal some interesting details. XDA Developers showed in a YouTube video that you could download version 5.20 of Fortnite for Android on your device. But you will not actually be able to play the game. We have heard earlier that the game will be exclusive to Samsung’s upcoming Galaxy Note 9 phablet for 30 days. The code within the APK files suggests it will also work with Samsung’s recently launched Galaxy Tab S4. The YouTube video does show that installing the game on Android devices other than Galaxy Note 9 and Galaxy Tab S4 shouldn’t be a problem. But other devices will not be able to play because the APK becomes functional only after your account has been whitelisted by Epic Games. The game has a number of checks for Samsung devices, including the existence of the S Pen stylus. The code within the APK files shows that Epic Games is using Samsung’s in-app purchase API, suggesting the game will be available on the Korean company’s Galaxy App Store. This method will ensure that Fortnite for Android is exclusive to the Galaxy Note 9 and Galaxy Tab S4 at launch. The popular game will be exclusive to these devices for 30 days. Considering the Galaxy Note 9 is rumored to hit the store shelves on August 24, you will have to wait until at least September 24 to play the game on your device if you don’t intend to buy the Note 9 or Galaxy Tab S4. There is one more catch. It will come to other devices in Samsung’s Galaxy family and stay there for 120 days. If you do not own or intend to purchase a Samsung Galaxy handset, you will have to wait until late November or early December to get the game on your handset. Why is Epic Games avoiding the Google Play Store? The second reason is that Epic Games wants to avoid the “30 percent ‘store tax’.” Google takes a 30% cut on revenues generated by apps in the Play Store. Sweeney believes it is “disproportionate to the cost of the services these stores perform.” Besides selling the game directly to customers, Epic Games is expected to make it available on third-party stores such as Samsung’s Galaxy App Store. Once the exclusivity on Samsung Galaxy devices expires, Epic Games will be releasing the Fortnite Installer on its own website to let gamers sideload and install Fortnite on compatible devices. Fortnite Installer measures only 2MB in size, which is pretty small. But the game itself is expected to be 2GB or more in size. The leaked APK download files obtained by XDA Developers also suggest that Fortnite won’t run on mid-range or low-end Android phones. It will also not support any Nvidia Tegra or MediaTek chips at launch. 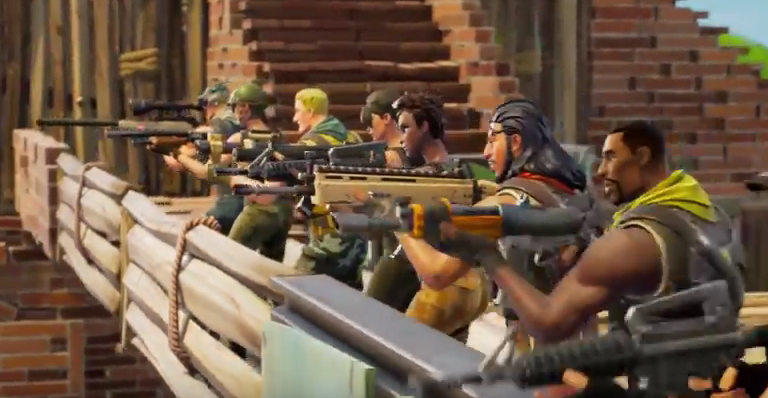 Epic Games could optimize the game to support more devices in the future, though. Epic Games’ decision to skip the Google Play Store could lead to a lot of Fortnite APK download scams in the coming months. Gamers could fall victim to fake APKs of Fortnite for Android. In fact, tons of fake APKs are already circulating on the Internet. There is a good chance that as soon as Fortnite goes live on the Galaxy Note 9 and Galaxy Tab S4, hackers would upload online a pirated copy of the game full of malware to attack the unsuspecting Android users. The insane popularity of Fortnite means hackers will be able to target a large number of users.